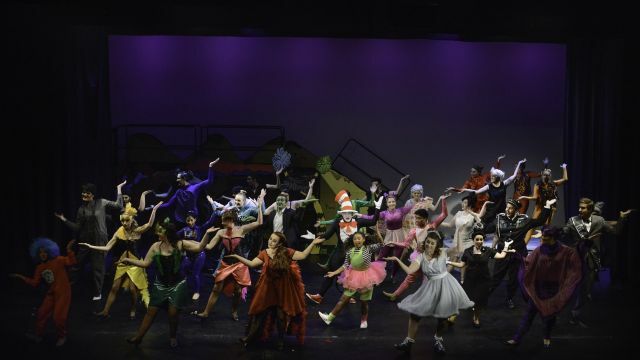 One of the more delightful things about Seussical the Musical is that almost everyone has the source material somewhere in their childhood memories. It was easy enough to be swept along in the musical whirlwind of stories, characters and a liberal sprinkling of catch-phrases and cameos. The production is simply and cleverly staged, and Wendy Braid's and Maree Castenmillerr's costumes are as vibrant and varied as Dr Suess' characters. The story centres around the sturdily faithful Horton the Elephant (played with sweet and stoic determination by Isaac Stott). Horton has to suffer ridicule (led by a fearsomely belting Kirsty Nisbet as the Sour Kangaroo) when he hears a Who and vows to protect the tiny planet of Whoville. Along the way, he who is tricked into sitting on a bird's egg while its mother, Mayzie (Laura Power, who shirks her responsibility with great style, dancing, singing and lazing about in red feathers and sequins) takes a permanent vacation to Palm Beach. Horton's two refrains: "I meant what I said, and I said what I meant. An elephant's faithful, one hundred percent!" and "a person's a person, no matter how small!" place Horton at the emotional centre of the musical, inadvertently winning the heart of Gertrude McFuzz, a bird with a tiny tail (Kelly Trenery) who goes on her own hero's journey to self-acceptance, all the while desperate to help Horton. Trenery's singing was simple and beautifully done (especially the plaintive "Notice Me Horton"). To bind all these narratives together, who else could there be but the Cat in the Hat, played with mischievous verve and glorious energy by Tim Addicoat. If Horton is the moral centre of the story, the Cat is the ringmaster, keeping the story ticking along, playing multiple roles, setting the scenes, and dancing tirelessly through the entire production. Young performer Thalia Osegueda as Jojo, the Whovillean who gets into trouble with her unbridled creative "thinks" joins him as a junior narrator, and plays her part fearlessly. Thing 1 and Thing 2 are often dancing attendance on the Cat, adding an extra layer of colourful chaos. Against the swirl of colour and noise in the Jungle of Nool are the angularly civilised citizens of Whoville, dressed in monochrome outfits, and devoted to order. The Mayor (Jay Haggett) and Mrs Mayer (Bec Muratore) are standouts as the concerned parents of Jojo and guardians of their tiny planet, displaying considerable vocal talent in their songs. Daniel Cooper gives a comedically committed performance as the deluded tinpot General Schmitz. Although the principal cast were a highlight of the show, the overwhelming sense of ensemble from the entire cast rivalled them as the most enjoyable element of the production. A special note too, that the cast's diction and commitment to maintaining American accents was almost flawless. 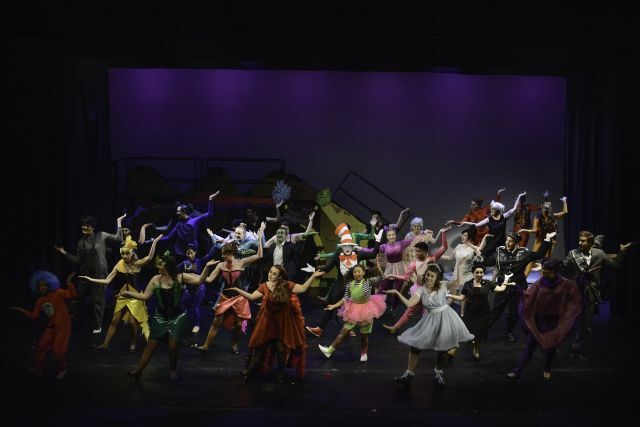 Vocally, the cast was very strong, displaying great versatility, particularly in the full cast dance numbers that opened and closed the show - choreographer Louisa D'Ortenzio producing maximum visual impact on the small stage. The offstage orchestra, under the baton of Shelley Dunlop, played to great and accomplished effect.